Our solid waste incineration power plant is for municipal solid waste disposal for environment protection. After incinerated, the heat can be used to generate electricity. Besides, the ash and slag can be used as cement additive and construction materials. The goal of recycle and reuse can reach. After incinerated, garbage is reduced weight by 75% and volume by 90%. The goal of decrement treatment can reach. After incinerated by high temperature in incinerator, pathogens in garbage are killed thoroughly. The goal of biosafety disposal can reach. 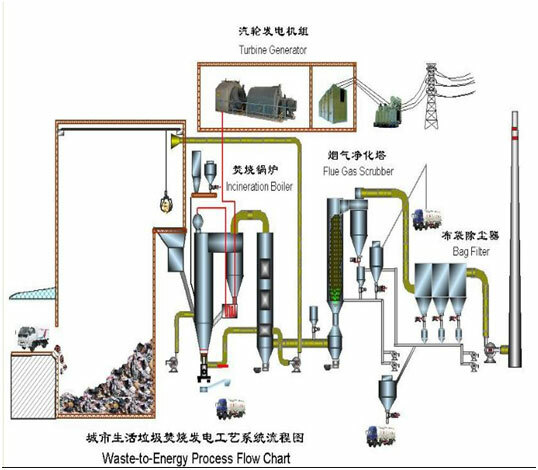 In sum, daily garbage incinerator power plant is the useful and efficient measure of environment protection to realize Recycle, Reuse and Reduce of garbage disposal. For fluidized bed, the incinerator structure is more simple. The leach ate (sewage) of waste is burnt out in the furnace so that no sewage needs disposing. But coal is necessary as comb rent fuel during incinerator running. The ratio of coal added in waste is less than 20% according to waste heat value index. For grate furnace, it doesn't need any comb rent fuel during incinerator running. But the incinerator structure is a little more complexity. It has mechanical grate in the furnace. Besides, The leach ate (sewage) of waste has to be disposed before discharging. And the efficiency of power generation will decline somewhat in cold winter because there is no comb rent fuel. As a plant for environment protection, the garbage disposal fees must be paid to incineration power plant. Otherwise, it can not survive because it is a kind of public welfare facilities.